I want to start this post with a small discussion on how I've begun to look at stocks that sell below book value and have what I'd consider average earnings power. Obviously not all companies can be valued through the same lens, but I think there are a lot of these 'two pillar' stocks out there right now. With the lack of net-net's outside of Japan, and not many actual high quality companies selling at multiples I'd consider cheap I've found myself looking at a lot of these two pillar stocks. Long time readers will recognize that the stocks I look at fall mostly into two different buckets, the irrationally cheap (things like net-net's), and average to decent businesses selling at low valuations (cheap hidden champions for example). Throw in a few special situations and that basically summarizes most of my investments, and not incidentally most posts on the blog. I've long recognized that there's a "hole" in my style but I couldn't quite identify it or make sense of it. The hole is what to do with an average business that's selling below book value and has decent earnings but is really nothing stellar. The answer was found in chapter 38 of the 1951 edition of Security Analysis. I want to say thanks to the reader who has pointed me in the right direction on this. This chapter was instrumental to Graham, Schloss and Cundill's investment styles. The reader who mentioned this to me is quite successful using this style, and I'm hoping to integrate it myself. The idea is there are two pillars of value, book value and earnings power. The investor wants those two values to support each other. So for example consider a company with a book value of $10 a share that's also earning $1 per share. With a conservative multiple on earnings such as 10 or 12x the earning power $10-12 a share supports book value. What we're basically saying is since earnings is in support of or slightly in excess of the company's book value there is no reason for the stock to trade below book value. So in the case of our example if the stock was trading at $5 it's reasonable to think they should be worth $10. The best way to describe the two pillar style of asset/earning investing is to use an example. I'm going to use Gévelot, a company that I found using the FT.com screener. The company consists of a parent company with three wholey owned European subsidiaries. The business segments of the subsidiaries are cold extrusion, fluid technology and automotive parts such as motorcycle carburetors. Both the extrusion and mechanical division make parts for the automotive industry, the fluid subsidiary supplies parts for a variety of industries such as oil and gas. The parent company owns office space which it leases out to the subsidiary companies. Dividends are paid out of the revenue received from rental income. The subsidiaries don't pay any dividends up to the parent level. I mentioned above that there are two pillars of value supporting intrinsic value. Buying when these pillars agree and well below their agreed on value gives the investor a margin of safety. The first pillar comes from the balance sheet; book value. There are a few things I want to highlight, the first is that working capital is very close to the current market cap for Gévelot. The company isn't a net-net, but they are trading very close to working capital. The second item is that debt to equity is reasonable at 31%. European companies tend to be more levered than their American counterparts. Even still 31% is very manageable. The last item of note is that equity is composed of very little goodwill or intangibles. This is an important point, one of the keys to this investment is the strength of book value. If book value was composed mostly of goodwill we wouldn't have as much safety in buying below book value. As it stands Gévelot's balance sheet is composed of quality current assets, and hard assets such as manufacturing facilities. The company's equity value is €127m, this is against a market cap of €51m a sizable discount. Gévelot is immediately enticing if you look their ticker up on any stock stat page, they have a P/E of 4.7 and a EV/EBITDA ratio of 1.7. I wanted to go a step further than just grabbing a few stats from Bloomberg. If we take the company's earnings from the last year or two and slap a 10x multiple on them they easily equal book value. So in a simple sense we have both pillars that match, the earnings power, and the book value. I didn't want to just take a gamble and use the last year's earnings so I built out a small spreadsheet showing the operating and net earnings over the past six years. I also tossed in cash flow and free cash flow over the past five since the 2011 annual report hasn't been approved yet. When looking at this my biggest concern is that Gévelot's margins are at an all time high and will eventually drift lower. 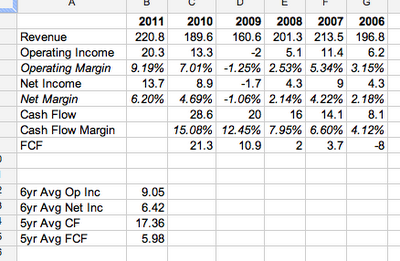 The good news is that they're a consistent cash generating company, even in 2009 when they had a loss. Some readers will note they aren't a free cash flow machine, which is expected for such a capital intensive business. Gévelot needs to continually reinvest in their company to keep up their earnings power. Even the low end of the range, the average earning power over the last six years is greater than the current market price. At a minimum Gévelot is worth 23% more than, and at most it's worth 178% more. I think the company is worth more than the minimum but less than the maximum which puts it in the range of €120m or so. With a possible value around €120m and a trading price at €51m I'm giving myself a pretty large margin of safety to be wrong. If it turns out that Gévelot is only worth €80m I still end up with a 56% gain which would be acceptable. Est-ce un bon investissement ou non? i used to own Gevelot some time ago. I bought them at that time because they bought back (a small amount) of own shares which is unusual for French companies. However, at the moment many auto parts companies are really cheap (see Lingotes from Spain). If reversion to the mean is relevant here then we can expect to see lower profits at some point in time. Margin mean reversion is what I'm afraid of. I really need to understand why margins are high, if it's a structural change then maybe they can be sustained at a higher level, otherwise this is undervalued but maybe by not as much. I am a Gevelot shareholder. Your numbers are consistent with mine. Why is it cheap ? The company is viewed primarily as a auto-parts manufacturer. That's the extrusion branch. Car sales in France and Europe are down sharply (economic crisis + there was a "cash for clunkers" program in 2009 so now sales are severely depressed especially for French car brands. Volkswagen and BMW groups are faring better). It's going to impact Gevelot. If you read the latest press release from Gevelot : "The worsening in the economy, particularly in Western Europe, and certain international geopolitical risks could result in lower revenue and profitability for the Group in 2012. Adjustment measures begun in March 2012 should help limit those effects." It trades on Alternext (ticker ALGEV the AL stands for ALternext), the regulation is much lighter than on a "regular" euronext market. Regulations concerning public buyouts are less protecting for minority shareholders. Liquidity is low. Heavy CAPEX requirements, you pointed that out. According to my limited experience the management is trustworthy. Their communication is rather on the prudent side. Bought back some shares in 2010 and 2006, as pointed out by mmi. So it's a standby for me, but willing to buy if the stock goes down significantly. Thanks for the comment, really awesome content. You answered a question I was wondering, why's it cheap. I read that release you mentioned, and they also had another that warned on profits for 2012. So that was two warnings, and finally there was a third comment saying they thought 2012 profits would be similar to 2011. So I'm not even sure if they know what it's going to be! Thanks for the info on the Alternext stuff. I had seen that and knew it meant lighter listing requirement and lower liquidity, but I didn't know about the buyouts. I like the company, I'm concerned that they're at peak earnings. I'm keeping them on my radar as I look at some other French small caps. Have you looked at Precia or Nexeya at all? Nothing but good things to say about Precia. One of my top holdings. Nexeya : I have it on my radar but haven't formed on firm opinion yet. Nate, good writeup and comments. I also had a look at Gévelot a while back and had he same concerns. The overcapacity of car production in Europe is substantial and that only means pressure on suppliers won't decrease. There are other more interesting ideas in France in Italy at the moment. I'm glad to see you mention the book value/earnings theory, which I almost always am thinking about when first looking at a potential investment. Now, I will first say that I have not looked at this company, so I am not in any position to critique someone who has done more work than I have! And, it sounds like their financial information is not ideal if you had to reconstruct the balance sheet yourself. 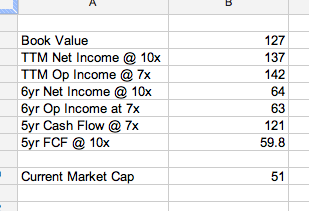 Anyway, I understand the use of a variety of earnings measures as a "first look" methodology for separating investments with some merit worth further study from the larger pile; however, of the various earnings measurements you calculate in the 2nd table, the only one I'd be thinking about is free cash flow. And, if the financials give you the information to do so, I might try to normalize it, if capex is predictably lumpy or whatnot, but I think putting it in a list with other measures and then assuming that something like the average of different measurements is representative just reduces the quality of your estimate. In practice, the problem here of course is that free cash flow as you have calculated it is the lowest estimate - which may or may not be warranted - but if it is correct it erases most of the margin of safety as it would be measured on the "earnings" side (obviously doesn't affect a "balance-sheet style" margin of safety). Just my two cents, and thanks for sharing the investment thesis! Thanks for the comment, glad you're looking at companies through a similar lens. 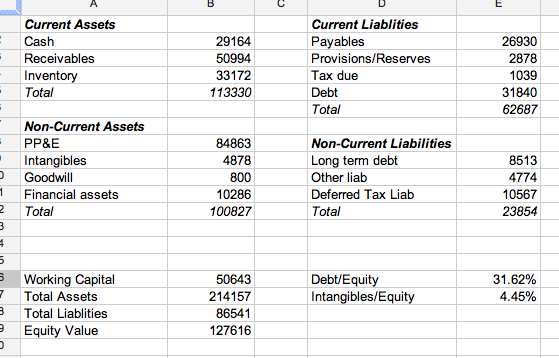 I wanted to clarify one point with regards to the balance sheet. The company only publishes full financials in the annual report. 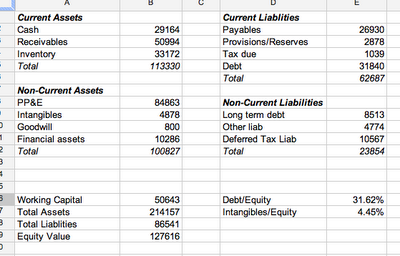 They release an interim income statement, and a really really clunky interim balance sheet webpage. The web page required me to flip back and forth and expand so many times it forced me to create the balance sheet spreadsheet so I could see everything at once. So you have a really interesting comment on earnings. For a company where capex requirements aren't as high I think I'm on board that using free cash flow is a lot better showing what shareholders walk away with. I guess I'm split on what to do with a company like Gevelot or any industrial with large capex requirements. True that the capex isn't returned to shareholders as a dividend or buyback, but the money is reinvested back into the business. I'd be curious to hear your thoughts on this. 1) It's often difficult to separate maintenance out of total capex with what is provided in the financial statement. 2) Even when you can, you have to make some guess what the incremental return will be on the non-maintenance capex. It's possible to estimate from the business's past capex spend/subsequent growth rate, but in this industry, in Europe today, I would assume using a dartboard might be as reliable as any estimate. Basically, who knows? These are easy things for me to nitpick from up here in the catbird seat while you are doing the actual work on the investment thesis, haha. in my Lingotes Post, I had a table of small Europeann Auto Parts companies. Especially the French Auto suppliers were extremely cheap. Tim, could you share "more interesting ideas in France and Italy"? Thanks! In your analyse, you have forgotten one point, which is a bonus one...Gévelot paid a dividend for 10 years (or maybe more...), about an 3 to 6% yield (Historic : http://www.tradingsat.com/dividende-Gevelot-ALGEV.html). The company bought back shares and withdrew its last year, about 4,7% of the capital. Here you have an analyse of a franch group of investisseur who hunts the "cigar-butts"
Hershey Creamery, a multibagger or mediocre?